Ordinance survey maps of 1816 show the pub in existence, and Mark Jennings informs me that it was built as a coaching stop along the main route to the then improving harbour at Sandwich. Above photos by kind permission of Kim and Brian Harris, current licensees of The Royal Oak, Whitfield. Date of photo unknown. 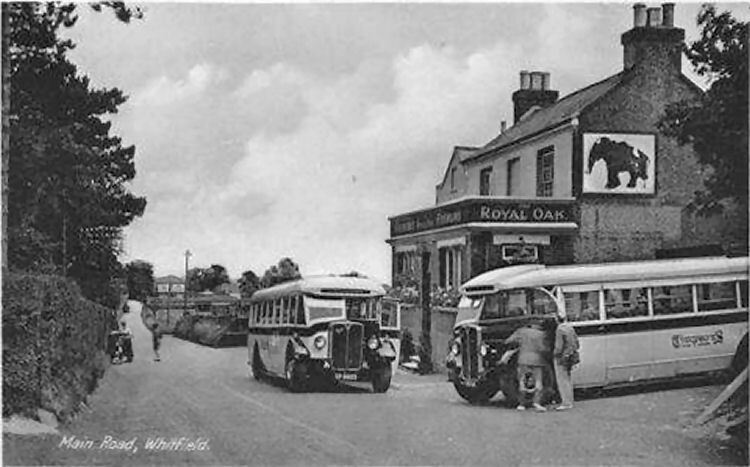 Above postcard showing the main road outside the Royal Oak, probably 1950s. Above pictures taken on 22 March 1999. Above 3 photos by Paul Skelton 18 August 2007. Royal Oak sign October 1986. Dover Telegraph Apr 15 1837. Valuable Timber; To be sold by Auction by Messrs Coleman and Harrisson at the "Royal Oak Inn," Whitfield on Monday April 17, 1837, at one o'clock in the afternoon, upwards of 200 tons of excellent Elm, Ash, Lime and Beech Timber, now lying in Waldershare Park. May be viewed by applying to Mr Daniel Hawkins, Waldershare, of whom Catalogues may be had from the 10th inst and of the auctioneers, Buckland." From the Kentish Gazette, 23 October, 1860. On Saturday week as Mr. Richard Wilks, of Little Mongeham, was proceeding to Dover about seven o’clock in the evening, having just passed the "Royal Oak," a horse and cart coming in the opposite direction ran into Mr. Wilks’s conveyance, the shaft passing into the side of his horse, inflicting a wound by which the poor animal bled to death in a quarter of an hour. From the Kentish Chronicle, 11 June, 1864. Edward Clover, a labourer, was summoned for being drunk and guilty of riotous conduct at Whitfield. The defendant did not appear. P.S. Pope staled that at 10.30 on the night of the 17th of May the defendant was creating a noise in the “Royal Oak” public house, from whence he was ejected. He afterwards continued this annoyance in the street, and refused to go when requested to so. Fined 10s. and 12s. costs, or 21 days’ hard labour. From the Dover Express and East Kent News, Friday, 20 February, 1891. Price 1d. George Marsh and W. Keetes were summoned for unlawfully assaulting Samuel Kirby. Mr. M. Bradley, who appeared for the defendants, asked that the case might be adjourned as he had not had time to prepare his case, it having been put into his hands only an hour previously, but the Magistrates decided that it must go on. Samuel Kirby, a wood dealer, of West Langdon, said he went to Whitfield, between five and six o'clock, on the 2nd of February, to sell some wood to the landlord of the “Royal Oak Inn,” Mr. Gosby. Whilst he was talking to Mr. Gosby in the passage, some people came into the house, and struck him under the ear, knocking him down. They then kicked him on the head, and took his bill hook from him. He crawled into the bar and became insensible. Several persons were present who saw the assault. Cross-examined: He had not been in the house more than ten minutes or a quarter of an hour before he was knocked down. There were other people in the bar besides Mr. Jones and Mr. Gosby. There had not been a free fight in the house. Albert Amos, of Studdle, said he was at the “Royal Oak” on the day in question. He went there about five o'clock, and stayed in the house till nearly ten. He saw W. Keetes strike Kirby in the eye. Nothing took place before. He was standing in the passage beside the bar. There was another man with Keetes, who took the billhook. Marsh was also present, but did not do anything. They knocked Kirby down and one of them kicked him. He then crawled into the bar. There was a lot of rushing about, but he went away into the tap-room. Cross-examined: There were about five or six country people, and seven towns-people. There was some singing, and a lot of beer was drunk, but he did not hear the country people offer a gallon of beer to the towns-people if they would sing. There was no quarrel between the town and country people. George Gosby, the landlord of the “Royal Oak,” said that on the 2nd February, Kirby came to see him about some wattles. He was standing outside the bar with his bill hook. He heard a disturbance, and Kirby then came into the bar, bleeding, and Keetes punching him. Keetes shoved Kirby over the bar and broke all the glasses. Witness separated the two. A free fight took place, and Marsh was fighting with his own people, but did not strike Kirby. Cross-examined: The defendants, with some other men, came into the bar about four o'clock, and, during the time they were in the house, had four or five quarts of beer. James Jones, of Ashley, said he saw Kirby come into the bar with two black eyes, and several cuts. He saw no blows nor heard any disturbance. Two labourers came into the bar, and several people rushed in after them and pushed him through the window. John Marsh, a carpenter at Whitfield, said there was a general row in the bar, but he did not see either of the defendants strike anybody. Mr. M. Bradley said that the whole matter seemed to have been a general disturbance in which both sides were to blame. Samuel Terry was called as witness for the defence. The Magistrates said that the case against Marsh would be dismissed. They would sentence Keetes after the other cases had been heard. John Marsh, Henry Marsh, John Sharp, William Page, George Marsh, and W. Keetes were summoned for committing damage at the “Royal Oak Inn,” to the extent of 11s. 8d. George Gosby said that the defendants came to the house about four o'clock on the 2nd February. He served them with four quarts of beer, but they would not pay for a fifth. They afterwards offered to pay, but he refused to serve them, as they seemed inclined to create a disturbance. They then commenced on Mr. Kirby, and Keetes knocked him about so, that he broke the glasses, and the rest pushed about and broke the panes of glass and cut the table in the bar room nearly through. Cross-examined: He did not notice any of the defendants, except Keetes, who broke the glasses, and G. Marsh, who shoved Mr. Jones through the window, commit any damage. John Marsh was also called, but he did not give any evidence to enlighten the matter. Mr. Bradley urged that the evidence was insufficient to show that any wilful and intentional damage was committed. The Bench sent Keetes to prison for a month, and fined him 30s. for the damage or in default a further sentence of 14 days. The seven defendants, charged with committing wilful damage, were fined 10s. or seven days. Dover Express (Dover, England), Friday, October 27, 1911. 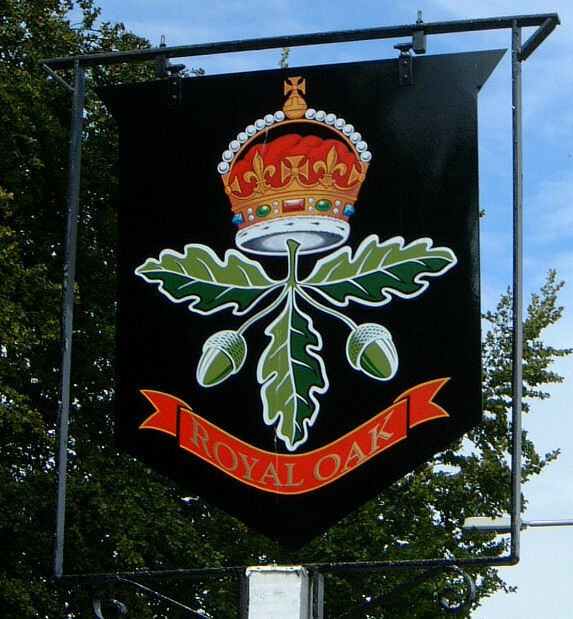 During the recent strong winds the large signboard on the wall of the "Royal Oak" was blown down. From the Dover Express and East Kent News, Friday, 17 March, 1922. Price 1½d. The “Royal Oak,” Whitfield, applied for an extension from 2.30 to 6, and the “New Inn Hotel” an occasional licence for the Point to Point races at Whitfield on April 5th. The Chief Constable of Kent objected to the former, but not the latter application. The Bench granted both applications. From the Dover Express and East Kent News, Friday 16 February, 1923. Price 1½d. Mrs. Bean of the "Royal Oak," Whitfield, was granted an extension for the Point-to-Point races on March 21st, during the day. From the Dover Express and East Kent News, Friday 20 March, 1925. Price 1½d. Mrs. Bean, of the "Royal Oak," Whitfield, was granted an extension for the West Street Harriers' point-to-point races on Wednesday, March 25th. From the Dover Express and East Kent News, Friday 23 April, 1926. Price 1½d. The Cresset Automatic Co. v. Antonio Grilli was a claim for the return of two automatic machines, and for £30 damages for detention or conversion. Mr. Roberts appeared for the plaintiffs and Mr. A. K. Mowll for the defendant. Mr. Roberts said that the plaintiffs made these machines and never sold them, but let them out on hire. The machines were patented. The partners in the firm were Messrs. Manchini and Gransbury of Gillingham. His Honour: What do the machines deliver, matches or ice cream? Mr. Mowll: It's a gambling machine. Mr. Roberts said that it had received the sanctions of the Police, and was designed to be erected in public houses and ice cream shops, and if the operator exercised skill he got his reward in the shape of a check, which enabled him to buy something over the counter. His Honour: They are called automatic skill machines - what automatic skill is I don't know. Mr. Roberts further outlined the facts and said that 350 machines were made in 1912, and were valued then at £3 each. The machines missing were Nos. 664 and 519. One day in May last Mr. Manchini went into the “Royal Oak,” Whitfield, and saw the machine No. 664 in the bar parlour. The name card had been removed and “Allwin De Luxe” substituted, and the number 2,664 stamped on the machine. As a result of stock taking the other machine was found to be missing, and from what Mrs. Bean, the landlady said, the defendant's father was communicated with and seen, and later the defendant. His Honour said that he thought the rule was that one could not sue a man for return of goods alleged to have been stolen without first prosecuting. Mr. Roberts said that they were not alleging that the defendants had any guilty knowledge. If they could not find the thief they could not prosecute. Subsequently Mr. Roberts dealt with the correspondence which had taken place, and said that the cudgels were taken up for the defendant by the Ice Cream Vendors' Association. He pointed out that the defendant declined to say where he got the machines. Only one had been found, and as soon as they communicated with the defendant it was removed from the “Royal Oak.” Subsequently correspondence showed that the defendant claimed to have purchased the machine from a man named McHardie at Taunton, now said to be dead, for £2 each machine, sold under the name of Cresset, in July. John Manchini, of 433, Canterbury Street, Gillingham, partner in the plaintiff firm, said that he made some of the machines before 1912. they cost £5 5s. then and about £14 now. It was patented and they were hired out to shops, but never sold. The shop keeper received 25 per cent. of the takings. On May 5th last year he found one of the machines in the “Royal Oak,” Whitfield. It bore the number 2,664 and had a card “Skill Allwin De Luxe” on it. He spoke to Mrs. Bean, and the next day he went to his store at Chatham and went through the books. He found that machine No. 664 was not in stock, but not shown as having been passed out. No. 519 was similarly missing. On My 14th, at the “Rose Tavern,” Dover, he saw the defendant, whom he had known ever since he was a baby. Witness said to him, “I see you have one of our machines at the “Royal Oak,” Whitfield.” He said, “Yes, I have bought two.” Witness said, “Who from,” and the defendant said, “That's my business.” Witness pointed out that those machines were never sold to anyone, and the defendant said, “I know that, but I am not surprised to know they have been stolen.” Witness told him there would be trouble if he did not give them up, and the defendant replied, “They are in my possession now, so I have nine points of the law.” He saw the defendant again on July 9th, and also a brother, but had never been told where the machines were obtained from nor where they were. At this point his Honour adjourned the case until Saturday at 10.45. Mr. Mowll reserving his cross examination which he said he could not complete in half an hour. At the request of Mr. Roberts, his Honour heard the evidence of Mrs. Bean, the licensee of the “Royal Oak,” Whitfield. She said the defendant came to her about Whitson last year. He asked her to have a “Crescent” machine, and she agreed. It was only there about three weeks, and the defendant fetched it away. Cross-examined (after seeing the defendant, who was called forward). It was not the defendant who brought it or took it away. It was a thinner brother. Re-examined: It was not Louis Grilli (also called forward), but she had seen the man in Court that morning. From the Dover Express and East Kent News, Friday 30 April, 1926. Price 1½d. The hearing of the case Cresset Automatic Company v. A. Grilli, a claim for the return of two automatic machines, which had been adjourned from the Dover County Court on Wednesday, did not take place as arranged on Saturday, Mr. Roberts, who represented the plaintiff, being indisposed. From the Dover Express and East Kent News, Friday 21 January, 1927. Price 1½d. Plans for internal alterations at the "Royal Oak," Whitfield, were approved. From the Dover Express and East Kent News, 18 March, 1927. Price 1½d. The licensee of the “Royal Oak,” Whitfield, applied for an occasional licence to sell from a marquee at the West Street Harriers' point to point races at Whitfield on March 31st, from 11 a.m. to 6 p.m., and also for an extension for the “Royal Oak” on the same day from 2.30 p.m. to 5 p.m. Superintendent Lane apposed the granting of the extension for the house and submitted that from 12 noon to 5 p.m. was sufficient for the occasional licence. The house was some way from the course. Some long way. It is generally the resort for all the riff-raff of the people, and I generally find it wants two constables to look after the place. Lord Fitzwalter said the Bench refused the extension for the “Royal Oak” and granted the occasional licence as suggested by the Police. From the Dover Express and East Kent News, Friday, 5 February, 1937. 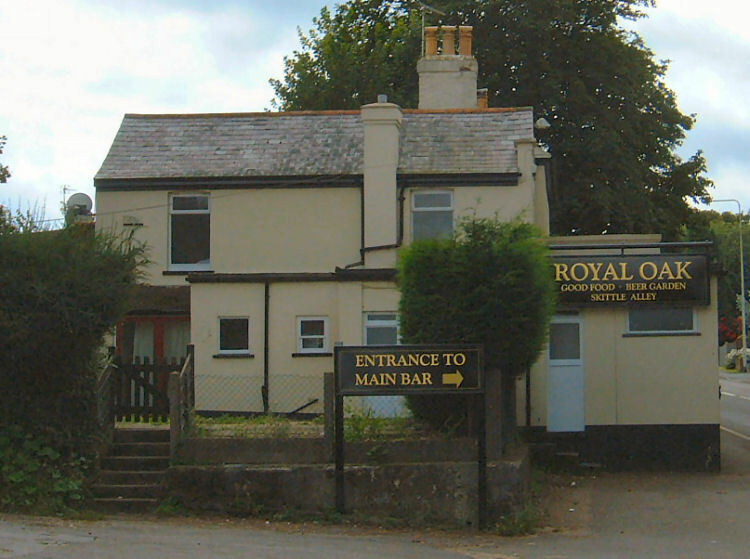 The licensee of the "Royal Oak," Whitfield, was granted an extension to 10.30 p.m. for a social on February 9th. From the Dover Express and East Kent News, Friday, 18 June, 1937. 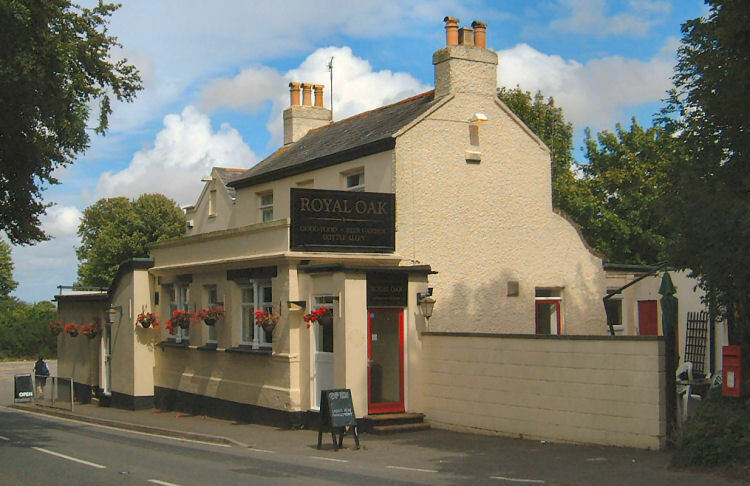 Plans for external and internal alterations to the "Royal Oak," Whitfield, were approved at the County Petty Sessions, Dover, on Thursday. From the Dover Express and East Kent News, Friday, 29 October, 1937. The licensee of the "Royal Oak," Whitfield, was granted an extension to 10.30 p.m. on October 29th, for a harvest supper. From the Dover Express and East Kent News, Friday, 11 November, 1938. Approval was given to plans for the construction of a new car park at the "Royal Oak," Whitfield. From the Dover Express and East Kent News, Friday, 21 July, 1939. The Ancient Order of Druids lodge No. 491, held a children's treat and sports at the "Royal Oak," Whitfield on Wednesday July 12th, and much credit is due to the Committee for the success achieved. Dover Express 28th April 1944. The Honorary Treasurer of the Royal Victoria Hospital begs to acknowledge, with many thanks, proceeds of the “Mirror Fund” per Mrs. Sayer, “Royal Oak”, Whitfield, near Dover. From the Dover Express, 27 November, 1970. Social Club pack inn to overflowing for trophy presentations. 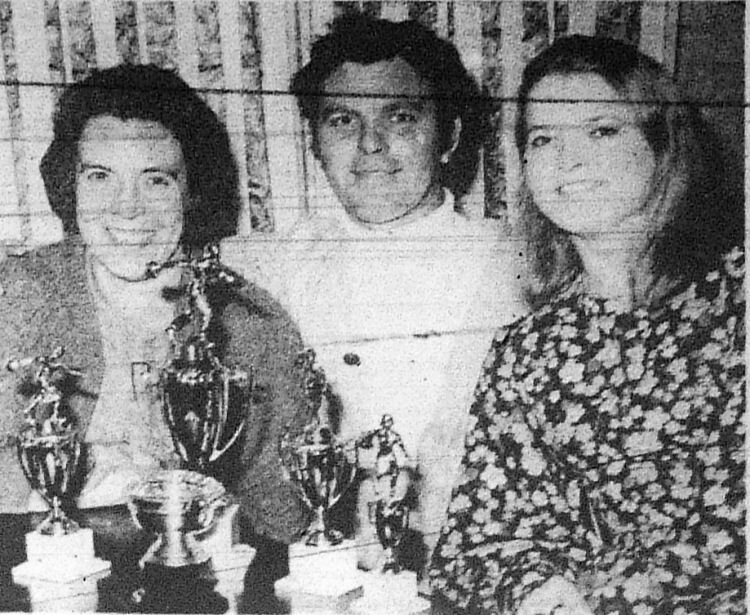 Rosemary Beverton, John Scamp and fiancée Carol Syme, with the trophies they won during the year for skittles and crib at the "Royal Oak." The "Royal Oak" public house at Whitfield was bursting at the seams on Saturday night - for the presentation of a magnificent array of trophies. The trophies were presented to members of the 130 strong Royal Oak Social Club, by the club's president, Mr. George Huntley of Pineham Farm. The individuals skittle champions were John Scamp and his fiancée Carol Syme, both of the "Royal Oak." John, who is also champion of the Dover and District Skittles Association wins £25 and a magnificent trophy. It went on display in the pub next to the trophy he received from the association - and completely put it in the shade. Carole, daughter of the licensee, Mr. Les Syme, won a trophy and £5 by becoming ladies' champion. She was pipped to the post, however, in the ladies nine-ball competition, conceding first place to Mrs. Roasmary Deverson who lives on Buckland Estate. Customers had to be turned away from the public house because of lack of space as the evening got under way. All the club's members had free beer tickets paid for by the club as they do four times each year. Men's individual 2nd. £10 and trophy, Harry Lees of The Drove, 3rd, £6 and trophy, Alan Busby of Sandwich Road, 4th, £4 and trophy, Gordon Freeman of The Acre, 5th Kelvin Taylor of The Acre and 6th, Wilf Hignet of Castle Drive. Ladies individuals 2nd, £3 and trophy, Mrs. Lynn Smith of Forge Lane, 3rd Mrs. Valerie Hignett, of Castle Drive. Crib prize - John Scamp. Among the guests were Mr. and Mrs. Tom Merricks representing the Dover and District Skittle Association. 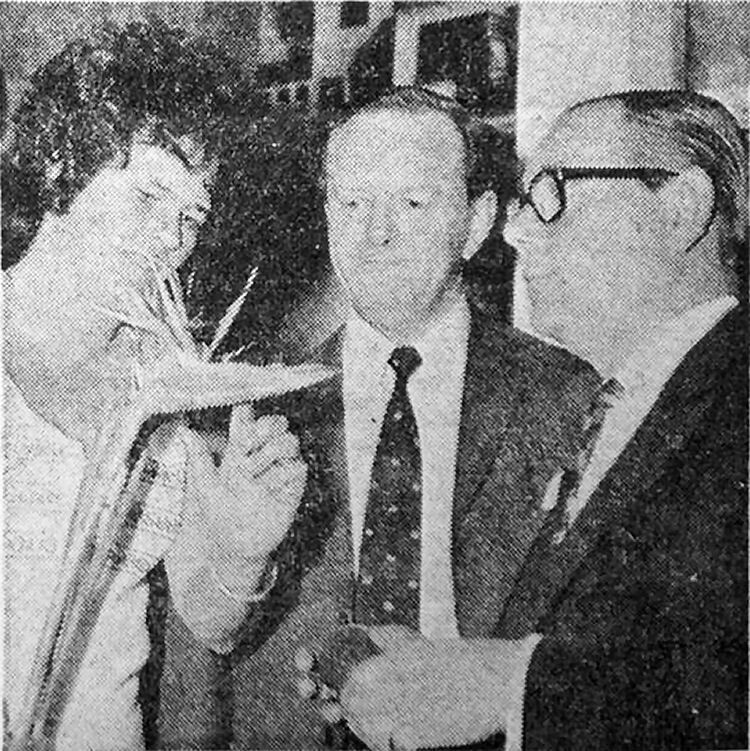 Above photo showing licensee's wife Mrs. Pat Wadey shows Mr. David Cobb, director of Whitbreads (right), and Mr. John Coomber, area tied trade manager, a bird of paradise flower she brought back from her holiday in the Canary Islands. LOCAL dignitaries and top brewery officials were at a reception on Monday to officially launch the new-style "Royal Oak" public house at Whitfield—believed to have been used as a hospital during the Napoleonic war — after a £15,000 face-lift. From a cramped, featureless country pub it has been transformed by the brewers, Whitbread Fremlins, into an attractive, bright establishment designed for the Seventies. During the conversion work builders were lowering the old kitchen floor when they discovered two shallow wells. The wells, filled in with rubble from the conversion, form another part of the hostelry's long and mysterious history. Said licensee Mr. Eric Wadey: “I would like to know a lot more about the house so if anyone can help me piece together the history I would be grateful. “Customers have told me about the use in Napoleonic times but there are large gaps." Part of the old part of the public house -— the oak panelled lounge — which has now gone is believed to have been part of a coach-house that once stood on the site. “I have been told that a coachman hanged himself there but I cannot find any record of it," said Mr. Wadey. The new public house bears little resemblance to the old one. The “L "-shaped building has been squared off and inside, the lounge is now an attractive beamed split level room with a short pine staircase connecting the two levels. Mrs. Patricia Wadey whose husband took over the pub 16 months ago, was responsible for the decor. Wide French doors from the lounge will be opened during the summer months to gain access to the beer garden which Mr. Wadey plans to improve as his next step. In the public bar two large chimney stacks have been removed and the bar counter moved back to provide more comfort for customers. Mr. Wadey is making it a “nautical” bar. His collection of articles already on display Includes the large brass capstan top and two portholes from the packet steamer "Nile" which sank oil the Cornish coast in 1875. They were a gift from customer Mr. Bill Norris who is a diver. Said Mr. Wadey: ‘‘We had no bathroom, kitchen or sitting room for three months but now the work is finished it was well worth while. "We have a regular crowd of regulars who bore with us even when it was difficult to serve them." In fact the alterations have been very good for business. “Many new faces have appeared in the house since the conversion was completed and our trade has already doubled, said Mr. Wadey, who was in the licensed trade in Jersey for 16 years and then had a short spell in the car trade in West Kent before taking over the Royal Oak. From The Dover Express 13 May 1999 by Sharon Ward. Mother fights to keep pub after her husband's death. A POPULAR landlady is fighting to keep open a pub she ran with her husband for eight years. Vanessa Baber, 42, tenant of the Royal Oak, Sandwich Road, Whitfield, has learned that Pubmaster wants to sell land next door for building homes. Pubmaster also wants to turn the pub into two homes, although these plans are being submitted separately to Dover District Council and have yet to be considered. Mrs Baber and her son, James, nine, would be left with no home and no work if planning permission is granted by the council, she said. She thought she had suffered enough when her husband, Mick, collapsed and died of heart failure last August, aged 52. Two weeks later the family pet and great favourite at the pub, Bonzo, a two-year-old Patterdale Terrier, was run over near the pub while searching for his master. Mrs Baber was trying to regain control of her life and that of her son, who attends Whitfield Primary School, when news came of the development plans. She said she was made aware of Pubmaster's plans by a letter in January, although the initial application to turn the pub into one home was refused. It was not until a friend spotted a sign from Dover District Council on a lamp post outside the pub, she was aware of Pubmaster's new plans. Now Mrs Baber is only being offered a five-month contract by Pubmaster, starting from June 9. She is being backed by many villagers who say Whitfield is such a big area it should have more than one pub. A protest petition is being set up at the pub. The issue came before Whitfield Parish Council on Tuesday night. From the Dover Express 22 July 1999 by Sharon Ward. Villagers pledge: We won't lose our pub without fight. VILLAGERS in Whitfield have joined together to tell Pubmaster: We will not lose our pub without a fight. More than 700 people have signed a petition, demanding that the Royal Oak, Sandwich Road, is not sold off for redevelopment as houses. Pubmaster wants to turn the pub into two flats and build seven homes on surrounding land. The plans will not be discussed by Dover District Council planning committee until September at the earliest. 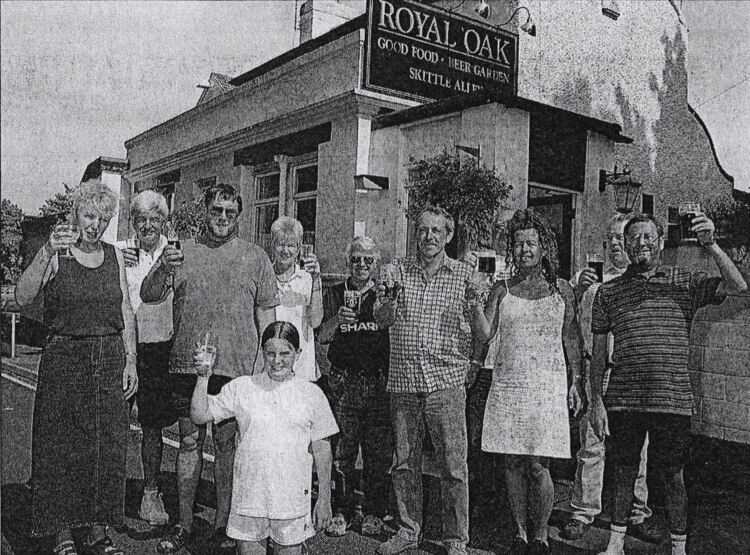 But villagers, led by the Save The Royal Oak Pub committee, want their voices heard now. Royal Oak tenant Vanessa Baber has received support from both regulars and those who rarely use the pub, because they do not want to see a local amenity disappear. Letters opposing the proposals have bombarded Dover District Council and the Dover Express. Fran Morrison, of Beechwood Close, has been drinking at the Royal Oak for three years. She said: "Its very sad that something like this is happening, especially in a village so large. We cannot possibly cope with one pub. "Older people down this end of the village cannot walk all the way to the other pub and we don't need any more housing here." Her view is echoed by many Whitfield residents who were angered by Pubmasters proposals revealed in March this year. Geoff Ellis, of Nursery Lane, captain of the skittles team, said the team would probably not keep going if the pub closed. He said: "We're all from the village so we want to play in Whitfield. This pub has had skittles teams for at least 30 years." Dereck Francis, of Cranleigh Drive, said: "I voted that council in and I think it should be doing what I want and not what Pubmaster wants." But while the fight continues Mrs Baber is unsure whether she will be tenant for Christmas and is not able to plan ahead for the millennium celebrations. She and her son, James, nine, have to wait to see whether their home and her work will be saved. From the Dover Mercury 5 August 1999. 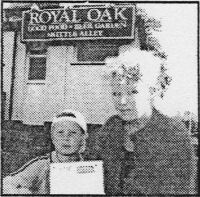 UNDER THREAT: Graham Mart, left, with Vanessa and James Baber, nine, outside the Royal Oak. Threat to pubs future 'last straw'. IT WAS only chance that led Angela Lumley from Eastry to park her car in a shady corner of Whitfield's Royal Oak car park. What she saw, pinned to a post, was notice of redevelopment plans by owners Pubmaster of which landlady Vanessa Baber was completely unaware. It is another blow for 42-year-old Mrs Baber. It is less than a year since her husband, Michael, died of a heart attack, leaving her to raise their son, James, on her own. 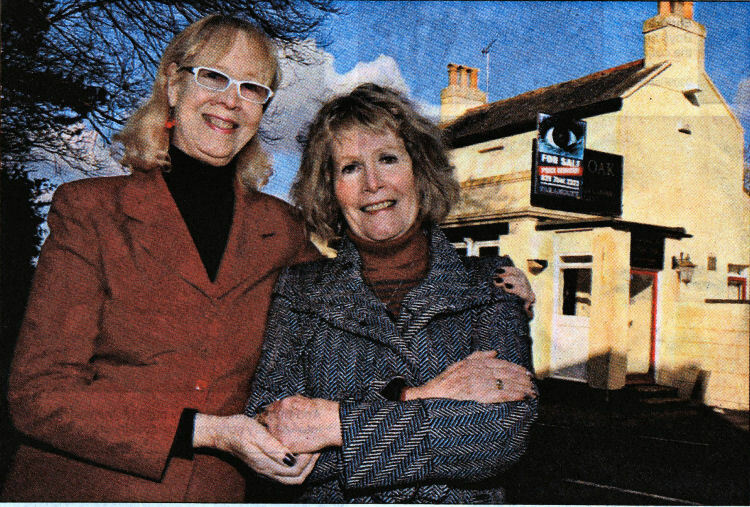 She said: "I knew that Pubmaster had plans for the Royal Oak. We were in the middle of doing up the kitchen when Michael died and after that I was told not to go ahead with it." The couple had been at the Royal Oak, the only home James has known, for nearly eight years. Before that she was at The Stag at Walmer. But Pubmaster wants to convert the Grade II listed building into two homes and develop seven detached properties on the adjoining land. It is an issue that has brought a huge groundswell of support from customers and those fighting to preserve a traditional village pub, even though they themselves do not drink. "One old man in his eighties said that over the last 60 or so years he'd seen all the new developments spring up round Whitfield, and this was the last straw," said Mrs Baber. "It was only because Angela had come to pick up her son, who had been staying over the weekend, that I found out when I did. The notice was pinned to a post on the verge and the grass was chest high." Graham Mart, who formerly kept York House, in Snargate Street, Dover, manages the pub with Mrs Baber, and with villager Ted Morrison is coordinating a campaign to keep the pub. Mr Mart said: "This is the local for the older people of the village, and some of them have been drinking here for 50 years." A Pubmaster spokesman told the Mercury: "The Royal Oak is not performing as we would like and so we can confirm that we are planning to sell it." The district council's planning committee will consider the plan on September 2. From the Dover Express, 19 August 1999. Is Viagra a potent threat to our village? I READ with interest and some foreboding your article (August 5) on the recommendations for greater flexibility towards building development in rural areas, as outlined in the Inspector’s report on Dover District Council’s local plan. Ash District Councillor Mary Smith is reported as being “delighted” by the inspector’s recommendations: however, what might be good for Ash is not necessarily good for other villages in the district. By all means, let us have more homes in those villages whose residents want them and will benefit from them, but let us also maintain a sensible balance between homes and amenities. 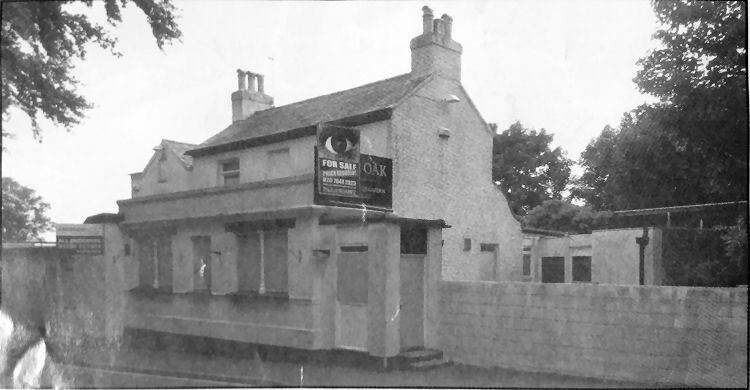 Many of your readers will be aware of unwelcome proposals to redevelop Whitfield's Royal Oak public house and its adjacent land into a total of nine dwellings. This would leave this already over-developed and overcrowded village with only one public house (not to everyone’s taste) for its ever-increasing population. Investment in the region by major employers, such as Pfizer, is to be welcomed, but the character and amenities of rural areas must be preserved wherever possible. Our villages could otherwise become more dormitory accommodation areas for senior employees from outside the region, many of whom might simply be looking for a pied-a-terre from Monday to Friday to be near the office. The effects on the housing market in general must also be considered, as it is highly unlikely that local residents will be able to afford any of the new homes envisaged in the inspector’s report. The inspector wants plans for homes in villages near Pfizer’s Sandwich plant to be allowed. 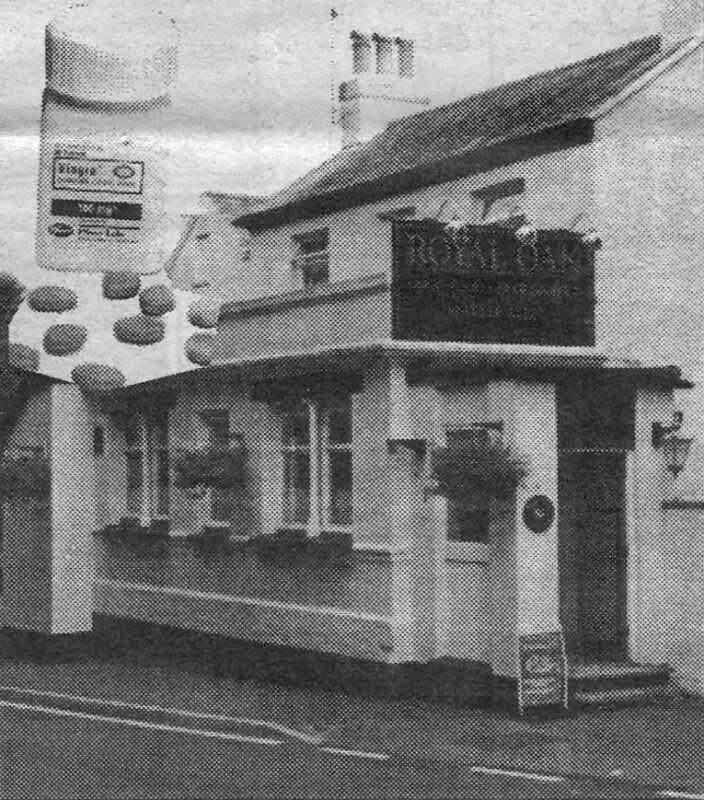 Is the Royal Oak to be sacrificed on the altar of Viagra? Dover District Council’s local plan sets out the policy for development of the district in the short to medium term - the loss of a village’s irreplaceable character and amenities is very long term indeed and must not be countenanced by those who are elected to run the district on our behalf. Mr T T Morrison Address supplied. From the Dover Express 2 September 1999 by Sharon Ward. Councillors ready to decide fate of popular village pub. 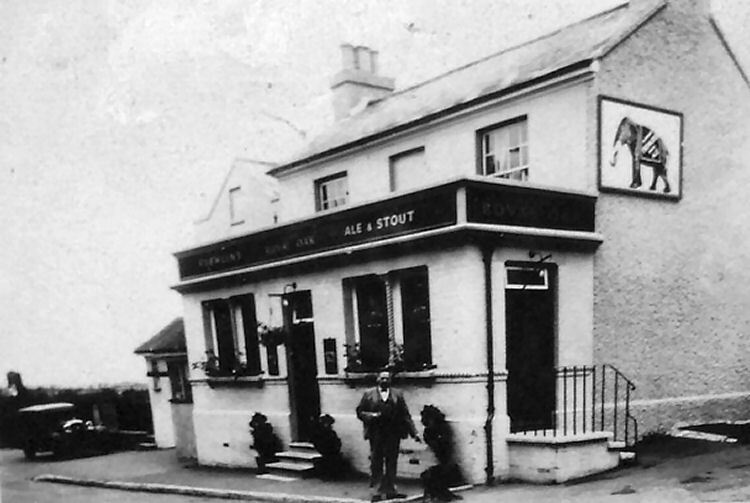 THE FATE of a popular Whitfield pub could be decided tonight at Dover District Council planning committee. Planning officers have recommended, if access arrangements are satisfactory, permission should be given to turn the Royal Oak into two homes. Tenant Vanessa Baber is devastated by the recommendations but hopes the councillors will listen to public representation. Many villagers have written to the council and the Dover Express opposing the plans. She said she would be relieved when the decision was made so she could at least plan her and her son James' future. Vanessa has been delighted with the support she received from locals, who have vigorously campaigned to keep the pub open. Many feel that the other pub in the village is too far to walk and caters for a different clientele. One of the campaigners unfortunately did not make it to see the final decision made. Owen McCallum, of Guildford Close, died after suffering emphysema. He had written to the council and the Express voicing his dismay at the proposed closure of the "centre of his social life". Vanessa's husband Mick died a year on Monday and she was hoping to rebuild her future when Pubmaster, which is putting in the application for change of use, took back its offer of a grant for a new kitchen which was planned while Mick was alive. But she was still struck by the news that Pubmaster wanted to sell the pub for redevelopment. Publican Vanessa Baber celebrates with son James. CHEERS filled Dover District Council chamber when the planning committee rejected a proposal to turn a Whitfield pub into houses. Locals to the Royal Oak turned up in force to discover the fate of their favourite drinking hole. None was more happy than tenant Vanessa Baber, who was too distressed by the whole situation to attend the meeting. She had to wait for the others to return to find out what the future held for her and son James. Vanessa said: "It's wonderful. We're both really over the moon about it. But we're just waiting to hear from Pubmaster what happens next." The plan to turn the pub into two houses was met with great opposition from the councillors, including Clive Hyde, of Whitfield. He said the Royal Oak was a profitable concern which served the community and a valued amenity which hosted many sporting events and raised money for Whitfield school's Aspen Unit. He said more than 3,000 Whitfield people could not be expected to have only one pub, which was at the opposite end of the village and served a different clientele. Cllr Sue Nicholas said: "We are told not to drink and drive and leave our car at home. "Taking away a village pub would mean a search for somewhere else to drink that people would have to drive to. 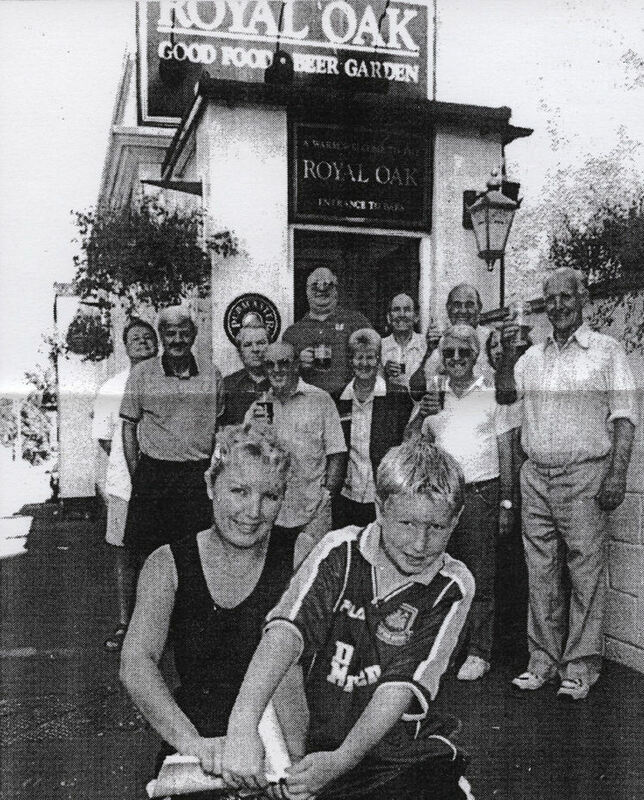 She said: "The Royal Oak has got community support. I feel we should be listening to the people of Whitfield." Cllr Simon Bannister agreed the application should be refused because it would increase the need to travel by private car and it would lead to the loss of a valuable community facility. For now the party will continue at the Royal Oak, but the fate of the surrounding land is still unsure as a separate application to build houses there still has to be decided. From the Dover Mercury 9 September 1999 By Sue Briggs. REGULAR customers at the Royal Oak at Whitfield have won their first fight to continue drinking and socialising at their local pub. However their battle to keep it open is not yet over, because the owners Pubmaster are expected to appeal against Thursday's decision to stop the building's change of use. "I thank everyone for their great support. They have been fantastic," said Vanessa Baber, the Royal Oak landlady. She only found out that the pub's owners wanted to convert the Grade II listed building into two homes, when a customer discovered the planning notice for the proposed re-development nailed to a post in the car park. Her regulars immediately co-ordinated a plan of action to fight the move and were out in force at Thursday's meeting of the district council's planning committee. They gave a round of applause and thumbs up signs to councillors as they left the council chamber after hearing speeches of support for their cause. Cllr Clive Hyde, ward councillor for the village, led the move to throw out the Pub master proposals, against the advice from planning officers. He said: "The Royal Oak is a profitable concern and has great potential to the surrounding local area and passing trade. "It is a valued amenity and its loss would be greatly felt. It also has a pleasant relaxing atmosphere for those seeking social friendship. "The pub is being rubbed out for faster profits for the company"
Cllr Bettine Walters, an ex-landlady, said village pubs were the backbone of England and described the possible closure of the Royal Oak as an absolute tragedy. Cllr Mary Smith warned her colleagues however that their reasons for supporting the Sandwich Road pub did not constitute sound planning ones for turning down Pubmaster's proposals. "There is no proper planning peg to hang the beer mugs on - listen to the brewer's comments," she added. Pubmaster insists there has been a decline in trade at the Royal Oak and say it would cost £194,000 to upgrade the premises. An appeal against the committee's decision is expected to be made by the applicants. From the Dover Mercury 7 April 2007. POLICE are writing to every publican in the Dover area to warn them of the consequences of serving alcohol to underage teenagers. It follows the three-month suspension of the premises licence of the Royal Oak in Whitfield. Officers found the pub selling alcohol to under 18s. District councillors suspended the licence after hearing from police that failings in the management of the pub were leading to crime and disorder in and around the premises. Police had called for the licence to be reviewed following at least two incidents of selling alcohol to under-age people. Tony Bartlett, the council's licensing manager, said: "Where a licensed premises can be shown to be causing anti-social behaviour, the committee has the power to curtail the activities taking place. "In this case it believed the problem was in the day-to-day management rather than the hours and licensable activities and it has acted on that belief." The bar person who made the sale was issued with an £80 on the spot fine. The Licensing Act 2003 contains four main objectives, which includes the protection of children from harm. Licensing Enforcement Officer PC Chris Birmingham said: "I urge all licensees to remain vigilant in relation to the ages of their customers, to adopt ID policies, as recommended by trading standards, and to ensure that all staff are trained in licensing legislation and their responsibilities under the four licensing objectives. "There is no question that swift action will be taken against premises and staff found to be serving underage people." Licensees who would like support and help regarding staff training issues, ID policies or other matters can contact PC Birmingham on 01304 218113. LICENSEE Anne Bliss described the hearing at which the licence was suspended as "a total shambles". ''You are guilty before you have a chance to say anything," she said. "We were only allowed to speak for a couple of minutes, and they didn't take any notice of what I had to say. "The whole system needs to be looked at. I wouldn't like anyone else to have to go through this." Mrs Bliss said she was looking after her father, who was very ill and has since died, at the time the investigation was taking place. "I had to leave the pub early sometimes to look after him," she added. "The one occasion when alcohol was sold to someone underage was when I wasn't there. But nothing was taken into consideration. "I have been working in this trade for a lot of years, I have run several pubs, and I have never been cautioned." Police evidence about crime and disorder in and around the Royal Oak at Whitfield was put to Dover Council's licensing sub-committee on Wednesday. Kent Police called for a review of the licence after at least two incidents of alcohol being sold to under-age people. Council licensing manager Tony Bartlett said the problem had been in the pub's day-to-day management. Kent Police is writing to every publican in the Dover area to warn them of the consequences of serving alcohol to underage teenagers. It follows a three-month suspension of a license covering the Royal Oak pub in Whitfield after officers found them selling alcohol to under 18s. The person behind the bar making the sale was issued with an £80 spot fine. PC Chris Birmingham, Licensing Enforcement Officer: 'In light of the above incident, I would urge all licensees to remain vigilant in relation to the age of their customers and adopt the ID policies as recommended by Trading Standards. Make sure your staff are trained in these standards and are clear about responsibilities under the Licensing Act. 'Swift action will be taken against licensed premises and staff found to be serving people under the age of 18. Need help on these issues? Licensees who would like to receive support and help on staff training issues, ID policies or other related matters can contact PC Birmingham on 01304 218113. From the Dover Express 26 April 2007. 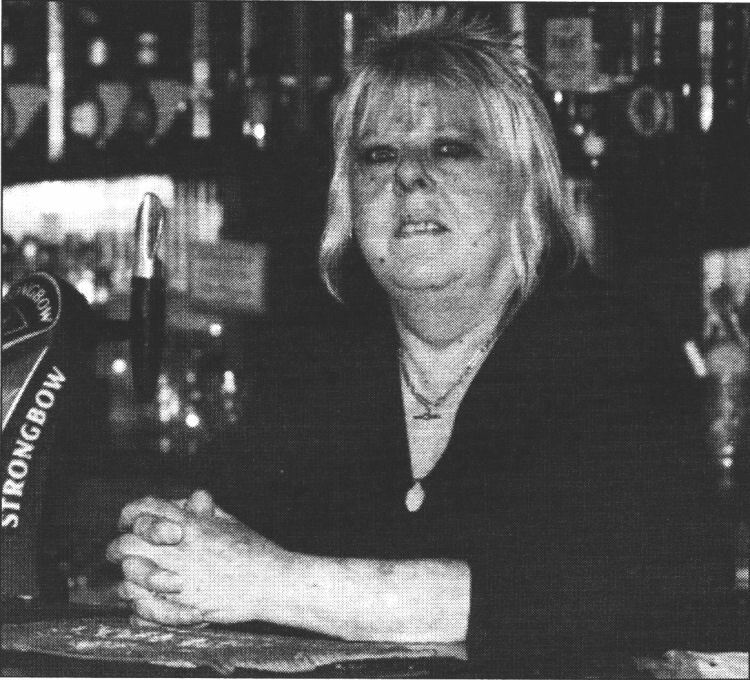 Anne Bliss of the Royal Oak in Whitfield. THE Royal Oak pub in Whitfield has become the first to have its licence revoked in a district-wide clampdown on underage drinkers. The pub has had its alcohol licence suspended for three months after police found teenagers drinking there earlier this year. Dover District Council licensing officer Tony Bartlett said more suspensions for pubs, clubs and off-licences are expected to follow as police and district council officers aim to hit pubs that serve under-18's. Mr Bartlett said: "There is undoubtedly a link between the sale of alcohol to underage persons and crime and disorder in the area. "We are making interventions, and other premises have had warning letters sent to them, although of course we will judge each case on its merits." Police licensing enforcement officer PC Chris Birmingham said "swift action" would be taken against offenders. He added: "I urge all licensees to remain vigilant in relation to the ages of their customers, to adopt ID policies. and to ensure all staff are trained in licensing legislation." 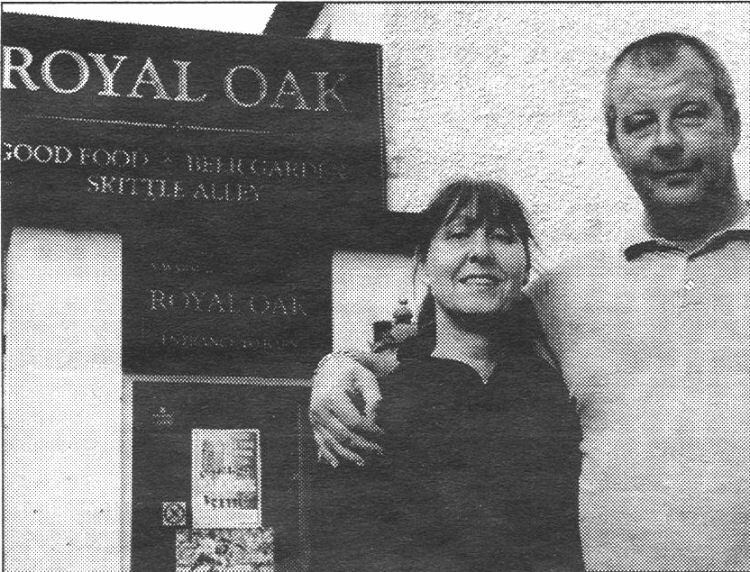 Royal Oak manager David Bliss, who runs the pub with wife Anne, admitted a barman did serve underage drinkers in one instance in January but said he felt the pub had been made a scapegoat. He said: "It was a kangaroo court, a stitch-up. I have been running pubs since 1970 and never had a warning or a caution or a prosecution. "I could walk into pubs in the town centre and I will see lots of underage drinkers, but we are a quiet out-of-the-way pub and an easy target." Mr Bliss added that he and Anne will not be in charge of the pub, owned by Admiral Taverns, when it reopens in July. The police have been clamping down on underage drinkers in recent months as part of an operation in which evening patrols have confiscated booze from young drinkers. The district council's licensing committee is due to meet this morning to consider the licence of Rivals nightclub in Deal after reports of noise problems from neighbours. From the Dover Express 1 November 2007. Royal Oak publicans Kim and Brian Harris. DOAJ1210070ak-1-4. Publicans hope refurbished Oak will bear more acorns. THE owners of a Whitfield pub are hoping its recent refurbishment will lead to an increase in trade. Husband and wife team Brian and Kiln Harris, 48 and 44; took out a three-year lease on the Royal Oak in Sandwich Road last July. Since then, the couple have spent thousands of pounds giving it a makeover, in the hope of attracting more customers through the door. Mrs Harris said: "We want families to come back to the pub. "We have spent money on a new bar, a smoking area in the garden and restaurant. We want it to be a real local pub." Mrs Harris, who works as a steward for ,P&O, said Dover needed more people prepared to invest in it. From the Dover Express, 7 August, 2008. THE freehold on the "Royal Oak" pub in Sandwich Road, Whitfield, is on the market for £800,000. The pub is being sold by London property agency Paramount Investments. From the Dover Mercury, 19 March, 2009. Mayor recounts happy days at family-run pub. Dover Mayor Cllr Diane Smallwood on her nostalgic visit to the Royal Oak with, left, her cousin Denise Daughton, who was born at the pub, and her sister, Anglea Gurney. DOVER Mayor Cllr Diane Smallwood has made a nostalgic visit to a pub which used to be run by her grandparents and has recalled the good times they had there. 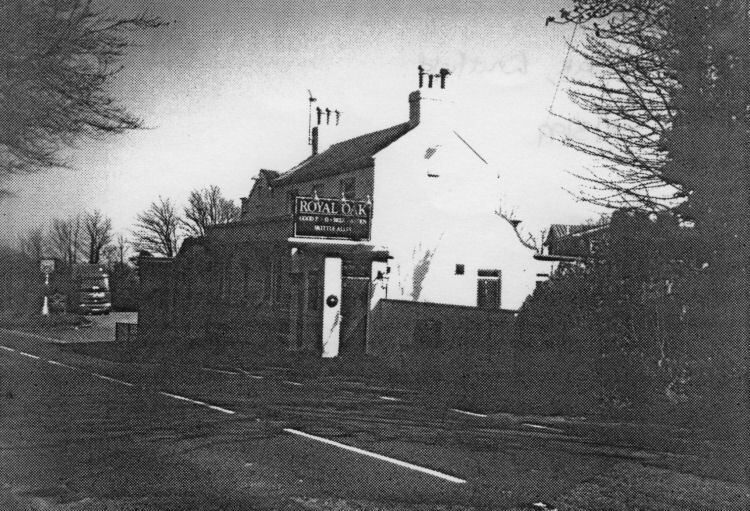 John and Hannah Sayer took over the Royal Oak at Whitfield in 1934. They had three children with Cllr Smallwood's father being their only son. "I am told that at the age of one year 1 used to stand on the bar and sing," said Cllr Smallwood. "My grandfather was a well known character. "He was about 20 stone, wore a straw hat during the summer months and smoked a clay pipe. He was very jovial and loved a good joke or playing tricks on people. He was at one time chairman of the Licensed Victuallers in Dover. "His best friend was Bill Broadley the local farmer whose grandson still farms and lives in the farm house at Whitfield to this day. "Bill would call in every morning after inspecting his fields with his flat cap and gaiters, boots always muddy, to have his drink and chat with granddad. On Thursdays he would go to Sandwich Market and then he would wear his bowler hat. "Whitfield was a small village then and the pub was the meeting place and the hub of the village. The post office was across the road as was the house of the village bobby who had a bicycle to do his rounds. "The Oak also used to hold dinners for various clubs and they were always big occasions. "There was a massive field adjoining the pub where many activities were held. There was a sports committee and sports days and other events were held in the Meadow, as it was called. As a little girl I can remember the fair coming once a year to the Meadow. It was a small fair with swinging boats and numerous stalls. "We used to accommodate all the coaches bringing Londoners down to Margate for the day. They would call on the way to Margate and back. The piano would be played and there would be a big sing-song and when they left we spent the next hour washing all the glasses ready for the next coach to arrive. "Later on the Meadow was used for people to pitch their tents if they were in the area for a holiday and through this we met many interesting-people. "As children we would stand and direct the ladies to the toilet, which was in the grounds of the back garden. It was a brick-built house with a toilet and wash basin. The gentlemen's toilet was also outside but that was at the front of the pub. "We also used to get stars that were playing in the Winter Gardens at Margate. My grandfather's brother was stage manager of the Winter Gardens and although they frequented the Rose in June opposite the Winter Gardens in Margate, if they wanted a ride into the country the Royal Oak at Whitfield would be their port of call. "During the war years when beer was sometimes in short supply the Royal Oak often had a queue of soldiers from Old Park barracks waiting for the doors to open at 6pm. 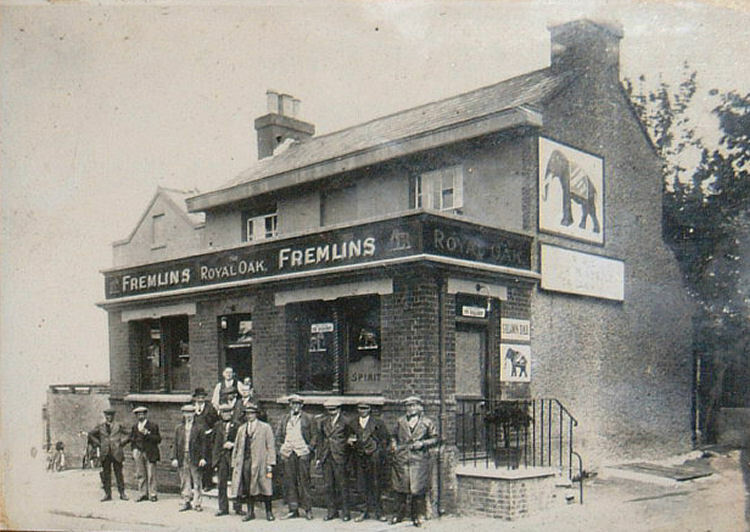 The Royal Oak was the only public house in the village at that time. During my years as a child and teenager it was a very popular pub for the Army and we had many happy hours with many regiments who were resident at Old Park Barracks. "My cousin was born at the Royal Oak. My sister and I spent our whole life there, until we left home either for career or marriage. When my sister was a toddler she used to go with my grandfather to sweep the outside and he used to drop pennies for her to find so that she thought sweeping was a fine job. "As a teenager I used to serve in the bar and I expect that is where I got my love of meeting people from. My grandparents were getting old by this time and my parents and my sister and I used to help them with the running of the pub. "On a Sunday morning we always had a full house. The local Fire Brigade would have their weekly practice and then finish up in the Oak for a drink before Sunday lunch. "We used to have darts and dominoes being played and I can remember the smoke being so thick you could hardly see. "We had a television for the Coronation of the Queen and made the day a special day for customers at the Oak. "In the early Sixties we had a skittle alley built and The Royal Oak became part of the skittles scene in Dover. Each week we would have different skittles teams to play during the summer months. This is still going on with pubs in Dover today." Cllr Smallwood's grandmother died in 1962 and her grandfather in 1965. They lived at the Royal Oak until their deaths. In the autumn of 1965 Les Symes became the new landlord of the Royal Oak, with his wife, three daughters and Alsatian dog Sabre. 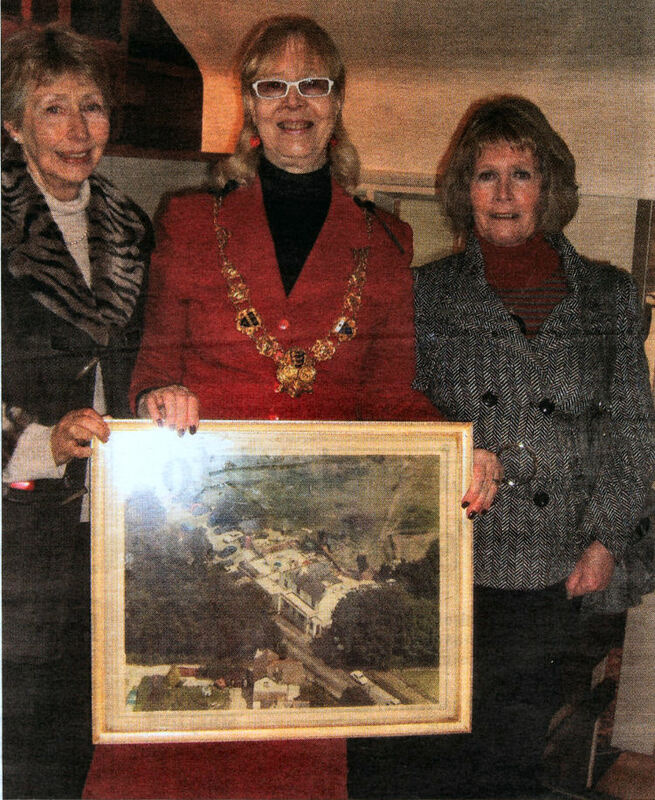 During Cllr Smallwood's return visit to the pub, she was presented with a picture of the building by Admiral Brewery. Grandad's pub at the heart of Mayor's village childhood. IF YOU fancy a chilled glass of lager, Dover's mayor is probably the last person you would think of asking for it, but Cllr Diane Smallwood is actually a dab band at pulling a pint. 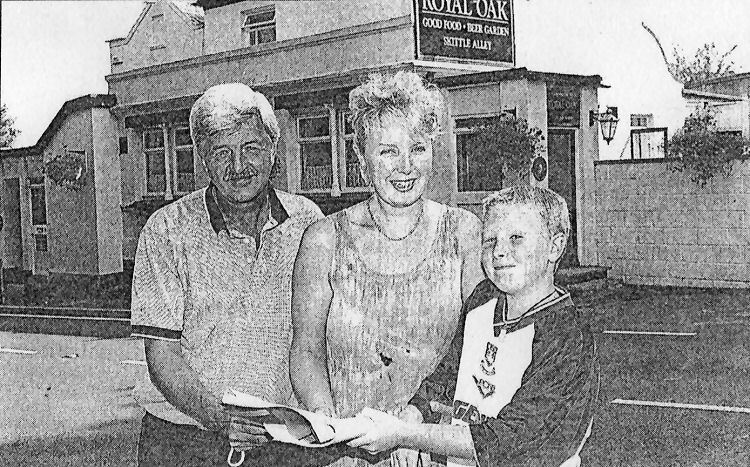 The mum-of-three spent many childhood years at The Royal Oak in Whitfield. She not only poured drinks but also was known to stand on the bar and sing though she was only one-year-old at the time. The Elvington girl, now 68, took a trip back to the pub this week and was prompted to tell us her memories. 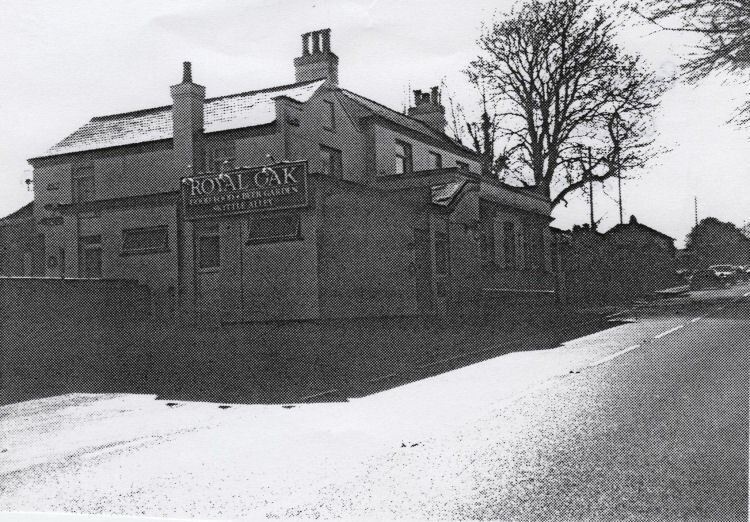 The former secretary said: "My grand-parents took on The Royal Oak at Whitfield in 1934. They had three children, my father being their only son. My grandfather, John Goldsach Sayer, was aged 60 at the time. He was about 20 stone, wore a straw hat during the summer months and smoked a clay pipe. He was very jovial and loved a good joke or playing tricks on people, He was at one time chairman of the Licensed Victuallers Association in Dover. "His best friend was Bill Broadley, the local farmer, whose grandson still farms and lives in the farmhouse at Whitfield to this day. Bill would call in every morning after inspecting his fields with his flat cap and gaiters, boots always muddy, to have his drink and chat with grandad. On Thursdays he would go to Sandwich market and then he would wear his bowler hat. "Whitfield was a small village then and the pub was the meeting place and the hub of the village. The post office was across the road, as was the house of the village bobby, who had a cycle to do his rounds. My grandparents, for whatever reason, always gave him his lunch." Grandmother-of-one Diane, who was once England schools high-jump champion, spent her entire childhood at the pub with sister Angela. She said: "There was a massive field adjoining the pub where many activities were held. There was a sports committee and sports days and other events were held in the Meadow as it was called. "As a little girl I can remembers the fair coming once a year to the Meadow. It was a small fair with swinging boats and numerous stalls. It was another event which the villagers always looked forward to. I think it was Penfold's Fair. "Later on, the Meadow was used for people to pitch their tents if they were in the area for holiday, and through this we met many interesting people. "In around 1949 Fremlins must have sold the top half of the Meadow to the Borough of Dover because eight council houses were built and they are still there today." In the pub's heyday the family would welcome coachloads of Londoners on their way to and from Margate, riders for the East Kent fox-hunts and serve up lunch and drinks to the Thanet Cycle Club. Diane, whose top tipple is brown ale or Guinness, said: "As children we would stand and direct the ladies to the toilet which was in the grounds of the back garden. It was a brick-built house with a toilet and wash-basin. The gentlemen's toilet was also outside but that was at in the front of the pub." During the war years, when beer was sometimes in short supply, The Royal Oak often had a queue of soldiers from Old Park barracks waiting for the doors to open at 6pm. It was the only pub in the village at that time. Diane said: "My cousin, Denise Daughton, was born at The Royal Oak. "As a teenager I used to serve in the bar and I expect that is where I got my love of meeting people from. My grandparents were getting old by this time and my parents, Alan and Edna, and my sister and I used to help them with the running of the pub. "Oh a Sunday morning we always had a full house. The local fire brigade would have their weekly practice and then finish up in The Oak for a drink before Sunday lunch. "We used to have darts and dominos being played and I can remember the smoke being so thick you could hardly see." Edna and John stayed at the pub until their deaths in 1962 and 1965. The Royal Oak, owned by Admiral Taverns, is no longer open; the site is subject to a planning application for four houses. WHITFIELD pub the Royal Oak, is being offered for sale at a cut-down price. The former Sandwich Street boozer is unlikely to reopen as a pub, say property agents at Paramount Investments, but interest has been expressed by other business people. The London-based firm has slashed the asking price from £800,000 to £550,000 to tempt developers and entrepreneurs. Paramount managing director Mark Greig said: "As no publican or pub company has stepped forward to save the Royal Oak, it may cease to be a pub at all." Anyone interested should visit www.paramount-investments.co.uk. The firm has reported an increase in sales of pubs in recent months. 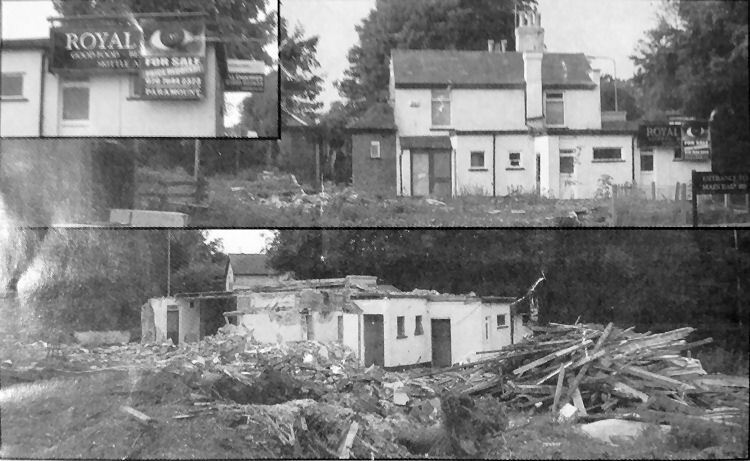 The CAMRA branch meeting of June 2008 reported that the pub was up for sale. HOMES PLAN FOR CLOSED PUB SITE. ﻿ANOTHER once well-used pub Is to go if planning consent is given for new homes. Developers are asking Dover District Council for consent to demolish the closed Royal Oak on Sandwich Road, Whitfield to make way for nine homes plus car parking spaces and landscaping. ROYAL OAK TO BE FELLED. ﻿THE once-popular "Royal Oak" pub on Sandwich Road at Whitfield is to be torn down and, if planning consent is granted, replaced by six residential properties, car parking space, landscaping and vehicular access. At one stage it was the only pub in Whitfield, and the stopping place for buses, but now there are two other pubs, The "Archer" and the newly opened "Kittiwake" on the former barracks' site. 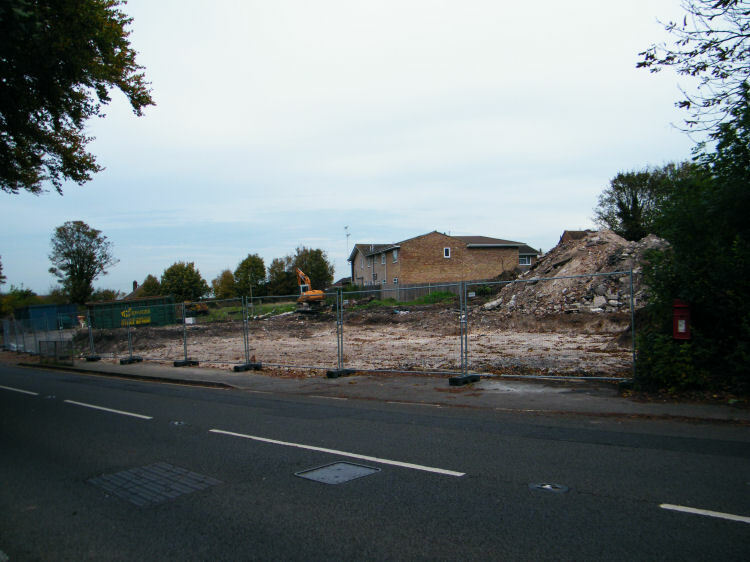 The demolition of the "Royal Oak" signals the end of another part of Whitfield and the arrival of nine new homes, the construction of vehicular access, associated car parking and landscaping according to DDC planning notice. The Royal Oak is in a half state of demolition and the road side walls still stand awaiting their final fate. Above photo supplied by Stuart Kinnon, 24 October 2010. Above photos by Paul Skelton, showing the completely demolished Royal Oak 29 October 2010. 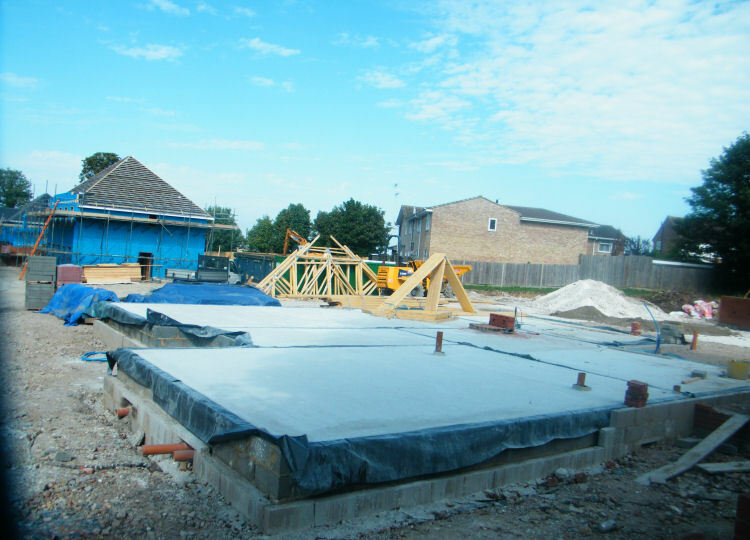 Royal Oak site, 3rd September, 2011 taken by Paul Skelton. AN INVESTIGATION into dangerous conditions at a demolition site in Whitfield led to court for Deal businessman Allan Smith, who was fined £7,000 and ordered to pay another £7,000 in costs. The Health and Safety Executive prosecuted him for failing to carry out an asbestos assessment and for not securing a demolition site. 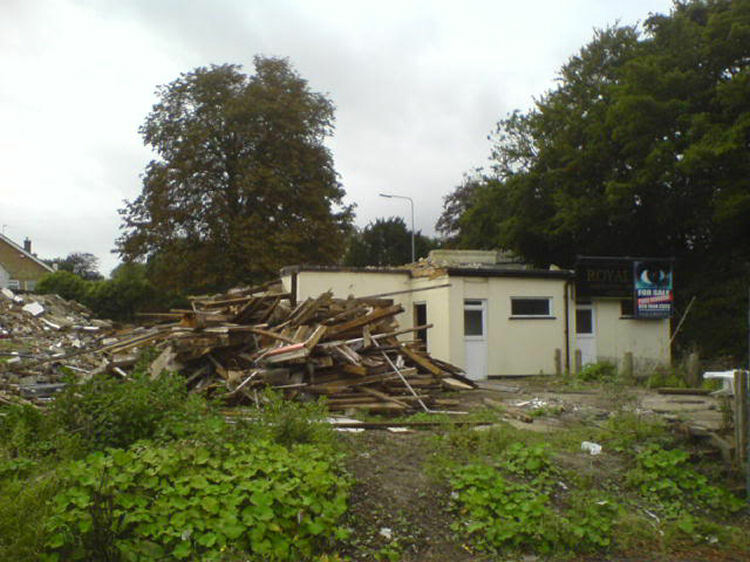 Canterbury Magistrates' Court heard that on April 19, 2010, that the "Royal Oak" Public House in Sandwich Road was bought for development. 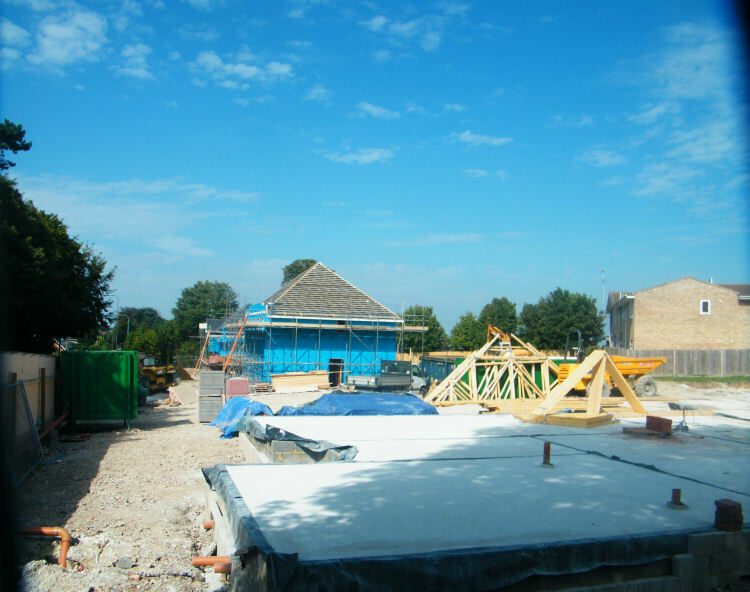 During the next six months Smith from ATS Developments acted as the principal contractor to demolish the building. On October 4, 2010, HSE was contacted by a member of the public who complained that the area was insecure and children were playing on the building site. An inspector from HSE visited on October 7 to find the pub partially demolished and the site unfenced, despite there being a public footpath running across the land. The HSE investigation found that no asbestos survey had been carried out prior to demolition, which remained the case even after HSE sent a letter to the partners stating that a survey needed to be undertaken. An Improvement Notice was served on October 8, 2010 about site security. Smith, of Bowling Green Lane, Deal, pleaded guilty to Regulation 5 of the Control of Asbestos Regulations 2006 and Regulation 27(2) of the Construction (Design and Management) Regulations 2007.